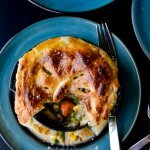 This Chicken in White Wine Sauce with Vegetables is layered with flavor and loaded with potatoes, onions, mushrooms, celery, and carrots. A tangy wine sauce brings everything together for this delicious one-pot meal. I woke up to the sound of a steady downpour of rain against my windowpane this morning. One as you would find in Springtime, not the Fall. It introduced a sleepy smile to my face. Before I ever got out of bed, I opened my weather app, and it subtly insists that I stay in today. Days like this demand that I cuddle up in a fuzzy blanket with my sweet golden doodles nestled next to me on the couch, pull my computer onto my lap and enjoy a little bit of downtime. I don’t get many opportunities like this so you better believe I’m gonna take full advantage of it. And the quintessential lunch for today is a Chicken in White Wine Sauce with Vegetables. A splendid choice for such a Fall rainy day. 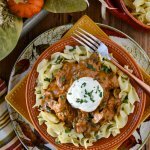 This is a warm and comforting dish for a “cozy” Fall Day. 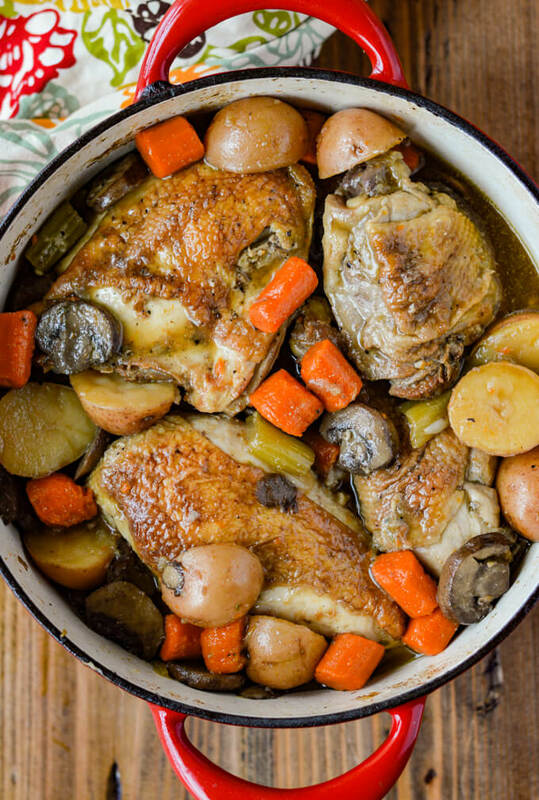 Not only is the recipe a convenient one-pot meal, the depth of flavors and the array of vegetables set this dish apart from any ordinary chicken “soup.” And a bonus – it’s healthy! This Pot of “Chicken Stew” could just about feed an army it makes so much. 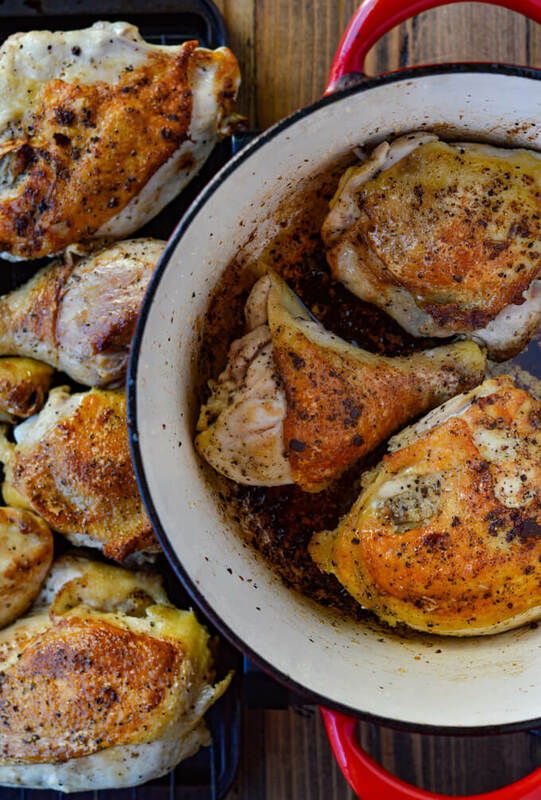 The recipe calls for 4 each of chicken breasts, thighs, and legs. Then when you add loads of vegetables, there’s enough for at least 8-10 people or leftovers for a couple of days. 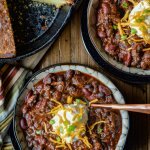 I had a hard time stuffing everything into my Dutch oven when I made it. It’s brimming not only with veggies but with flavor galore. The marinade alone infuses the chicken with flavor and juiciness. And then, of course, cooking the chicken with more veggies, garlic and herbs, throws it over the top in deliciousness. Step #1 – A time for marinating the chicken. Because there are so many pieces of chicken, I used two large gallon ziplock bags. You could probably get everything into one jumbo ziplock bag. 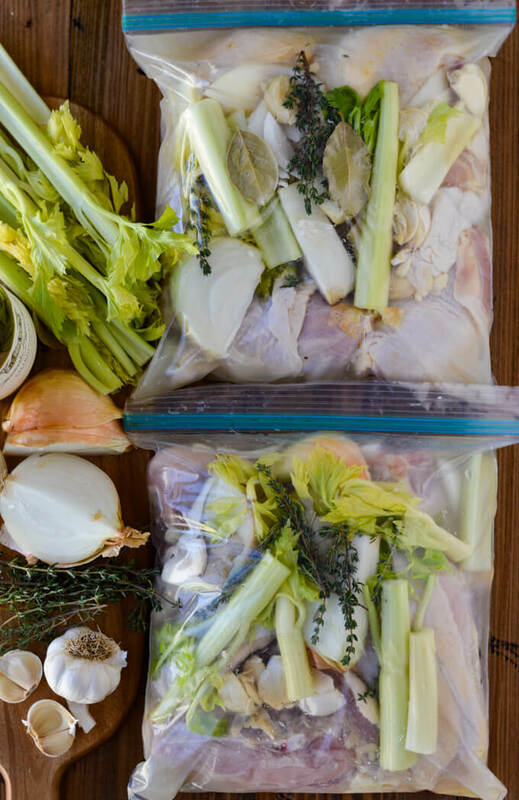 Throw the chicken pieces, celery along with the leaves, onions along with the skin, peeled and crushed whole garlic cloves, fresh thyme and bay leaves in the bags. Pour the wine over all of it and let sit in the refrigerator for a couple of hours. You don’t have to spend a lot of money on a dry white wine for this marinade. A cheaper Chardonnay is what I picked up and it was perfect. 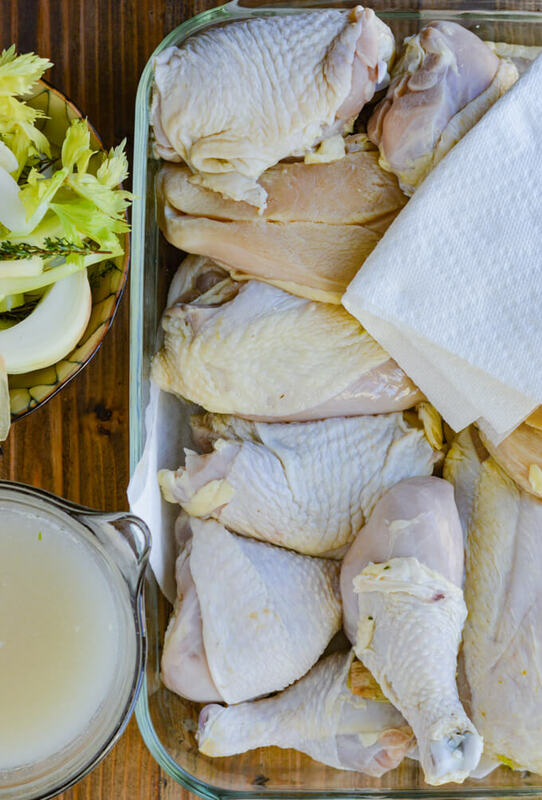 Marinating the chicken with a white wine helps tenderize the meat while adding an influx of flavor with the veggies and herbs. Step #2 – Drain the marinade and pat the chicken with paper towels. Clip the corner of the ziplock bags and drain out the marinade into a bowl. This liquid will be used later on in the recipe. You may have to help clear the clipped corner of the chicken or veggies as they tend to get in the way while it’s draining. Pat the chicken pieces with paper towels to dry them. This will help keep it from steaming instead of searing. Step #3 – Work in batches to sear all the chicken pieces. One thing you don’t want to do is crowd the pieces of chicken while you are searing them. Therefore cook them in batches, about 3 or 4 pieces at a time. Heat olive oil over medium-high heat in a dutch oven and let it get hot enough to sizzle the chicken when you put it in the pan. Begin with the skin side down and cook for 7 minutes. Turn each piece over and cook for another 5 minutes. Remove each batch and let them drain on a wire rack that is set over a shallow roasting pan or cookie sheet. The juice that is collected will be added later on in the recipe. Step #4 – Cook the mushrooms until nice and brown. In the same dutch oven that you cooked the chicken, add the sliced mushrooms. 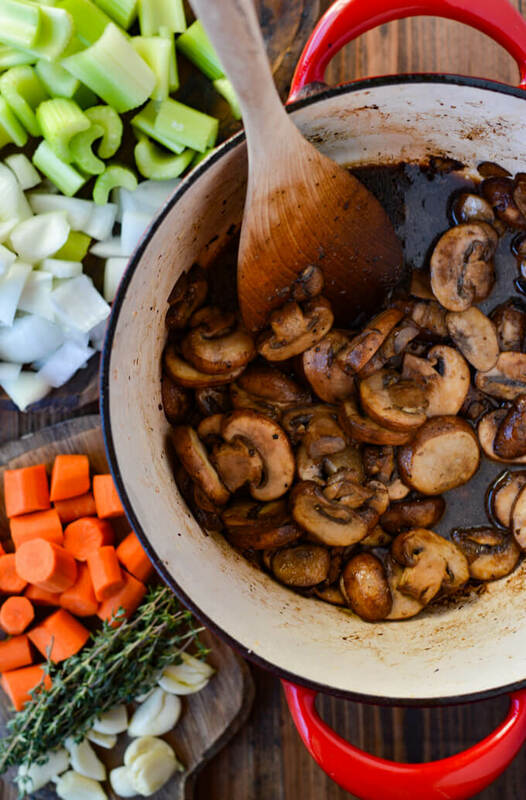 Continue cooking over medium-high heat until the mushrooms release their moisture and are browned. It should take about 10-12 minutes. Using a spatula, loosen all the chicken bits from the bottom of the pan. The liquid from the mushrooms helps with this as well. Step #5 – Brown the onion, celery, carrots, and garlic in the Dutch oven. Add the veggies and season generously with salt and pepper. Continue cooking over medium-high heat, stirring frequently for probably 6-8 minutes until they are browned and slightly tender. Step #6 – Add the “reserved” wine, thyme, bay leaves, pearl onions, and potatoes. Turn the heat down to medium and again scrape the bottom of the pan to loosen any additional brown bits. Stir in the chicken stock. 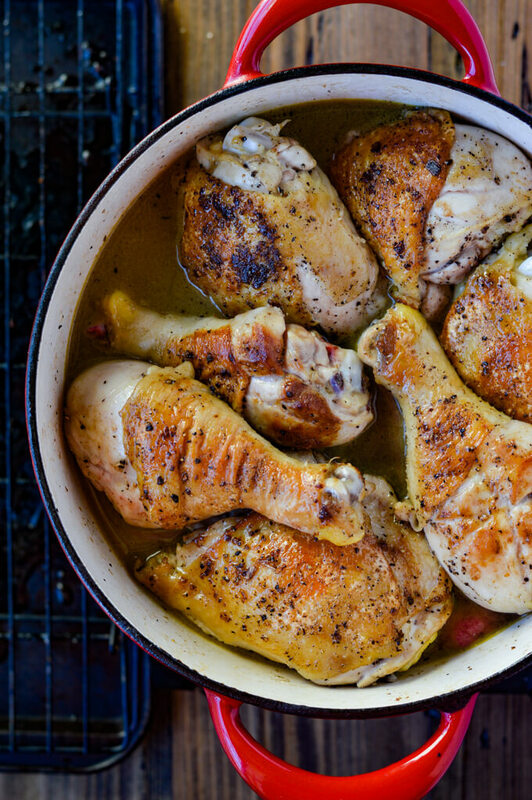 Step #7 – Add the chicken thighs and legs to the Dutch oven. The chicken thighs and legs take longer to cook than chicken breasts because they have a higher fat and density content. So in the meantime, cover the chicken breasts with foil and place in the refrigerator while the other meat is cooking. Lay the thighs and the legs on top of the vegetables with the skin side up. Do not submerge them into the liquid. Add the additional juices from the roasting pan and cover the Dutch oven. Place it in a preheated 350°F oven and cook for one hour. 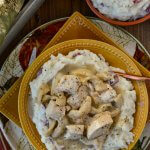 Step #8 – Add the refrigerated chicken breasts. This is the last step before you get to thoroughly enjoy this little bit of comfort. Remove the pan from the oven and add the chicken breasts (skin side up) on top of everything else. Cover it again and return it to the oven for about 20-25 minutes. The thickest part of the chicken breast should register 155°F on an instant-read thermometer. Although this recipe takes a little bit of time and a lot of chopping, it is so worth it in the end. 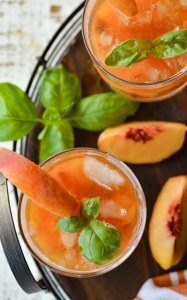 I’ve always found that fresh produce sets recipes apart from a humdrum meal and adds a wholesome aspect to any dish. 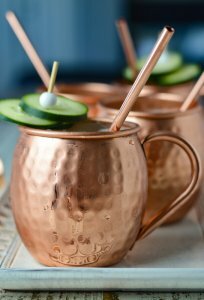 Believe it or not, with this healthy recipe, you can have all the “comfort and cozy” you desire on an Autumn Day. 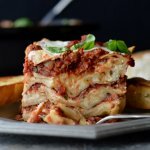 Click on these links to take you to a few of my other comfort food recipes. 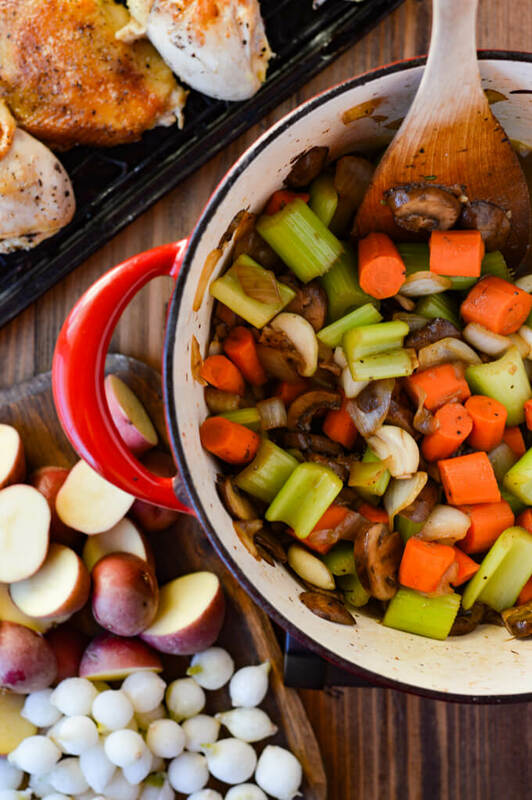 This Chicken in White Wine Sauce dish is layered with flavor and loaded with potatoes, onions, mushrooms, celery, and carrots. 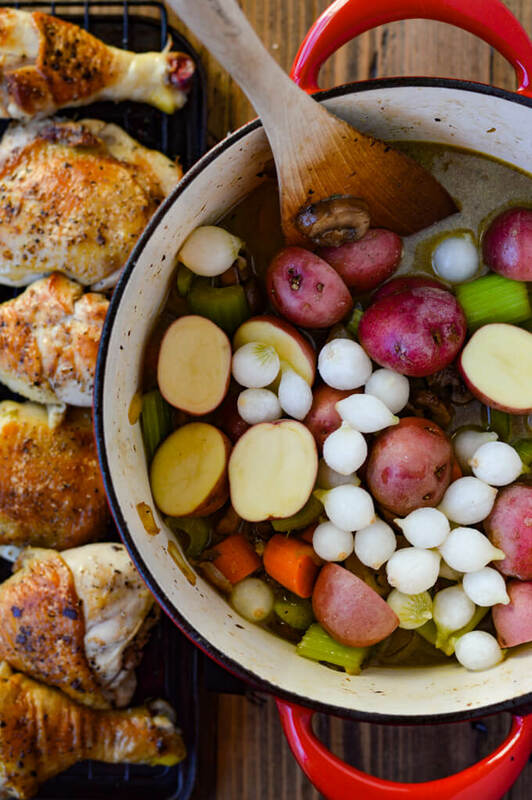 A tangy wine sauce brings everything together for this delicious one-pot meal. Combine chicken and the marinade ingredients and separate in two large ziplock bags. Place in refrigerator and let sit for 2 hours. Tur the bags over every 30 minutes to saturate all sides. When finished marinating, cut a small hole in the corner of the ziplock bag, drain and reserve the wine. Remove the Chicken and pat dry with paper towels. Generously salt and pepper each of the chicken pieces. Heat the olive oil over medium-high heat in a large Dutch oven. Work in batches and sear both sides of the chicken. Cook the skin side down for 7 minutes, turn and cook another 5 minutes. Drain chicken on a wire rack placed over a shallow roasting pan. Add mushrooms to the Dutch oven and cook over medium-high heat until the mushrooms release their moisture and are browned, about 10-12 minutes. Use a spatula to loosen all the chicken bits from the bottom of the pan. Add the onion, celery, carrots, and garlic. Season with salt and pepper to taste. Continue to cook on medium-high, stirring frequently for about 6-8 minutes, until browned and semi-softened. Add the reserved wine, thyme, bay leaves, pearl onions, and red potatoes. Loosen any additional browned bits on the bottom of the pan. Stir in the chicken stock and bring to a soft boil. Add the chicken thighs and legs atop the vegetables with the skin side up and not submerged in the liquid. Add the additional chicken juices from the roasting pan. Cook in a 350° F oven for 1 hour. 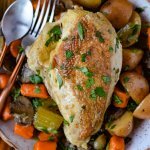 Add the chicken breast to the pan with the other meat and cook for an additional 20-25 minutes or until the breasts register 155°F on an instant-read thermometer in the thickest part of the chicken. Serve pieces of chicken atop a bed of veggies with juices. Garnish with chopped parsley. Use chicken pieces that are bone-in and skin on. There is a wonderful flavor added from these parts of the chicken. Because there are so many pieces of chicken, I used two large gallon ziplock bags for marinating. You could probably get everything into one jumbo ziplock bag. When marinating, I add the top leaves along with the celery and the onions with their skins as well. These add additional flavor to the marinating process. Crush the garlic cloves in order to release their full flavor. You don’t have to spend a lot of money on a dry white wine for this marinade. 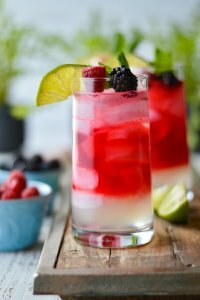 A cheaper Chardonnay is what I picked up and it was perfect for this recipe. Clip the corner of the ziplock bags and drain out the marinade into a bowl. This liquid will be used later on in the recipe. Pat the chicken pieces with paper towels to dry them before you sear them in the Dutch oven. This will help keep it from steaming instead of searing. Generously season both sides of each chicken piece with salt and pepper before you sear them. Don’t crowd the chicken when you are cooking the pieces. Work in batches and sear 3 or 4 pieces at a time. Cook the mushroom slices over medium-high heat until they release their moisture and are browned. After cooking the mushrooms, use a spatula to loosen all the chicken bits from the bottom of the pan. The liquid from the mushrooms helps this process. The chicken thighs and legs take longer to cook than chicken breasts because they have a higher fat and density content. Therefore these should be cooked first in the oven while the chicken breasts sit in the refrigerator. Lay the chicken pieces atop the veggies skin side up. Do not submerge the pieces into the liquid. The juices from the seared chicken that have drained from the wire rack are full of flavor. Make sure and add them along with the chicken stock. I have served this recipe in two different ways. One with the whole chicken pieces atop the bed of veggies. The other way is to remove the meat from the bones after they’re cooked and add the chunks of chicken to the pan. Both are delicious. 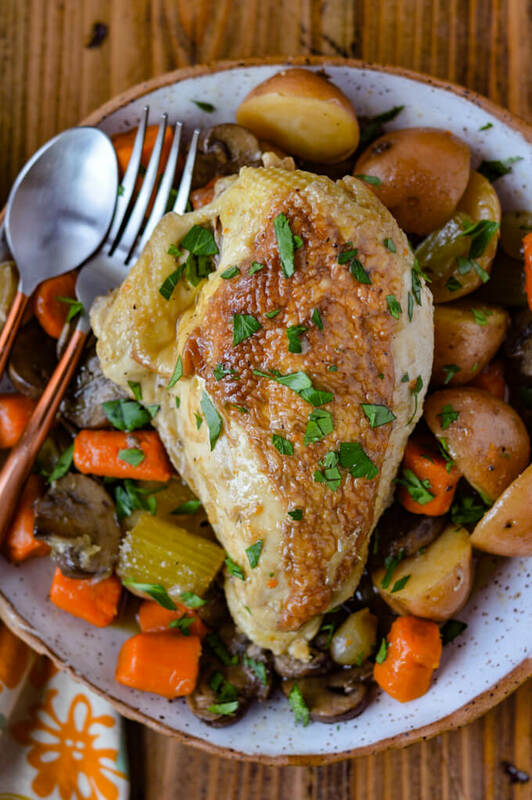 You honestly cannot go wrong with all of these veggies along with the chicken. And that it is a one pot meal makes it so convenient. What a lovely recipe! 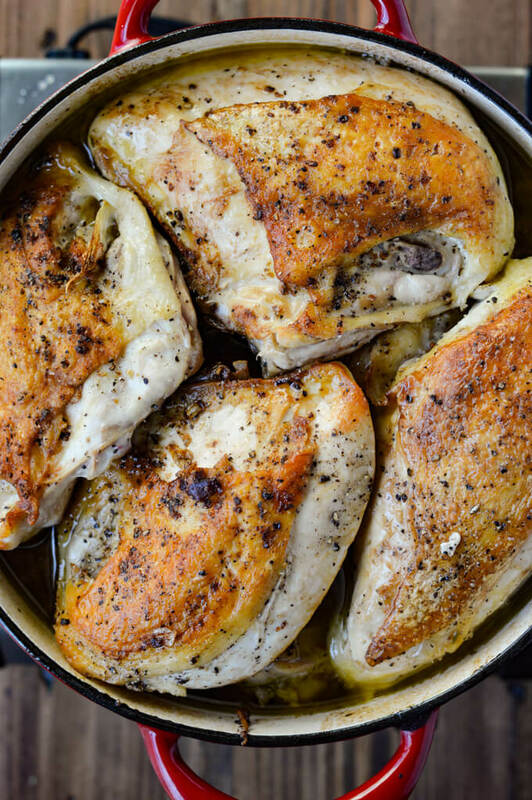 Your browned chicken is perfect. And I’ve got a refrigerator full of white wine! Wonderful Mimi! You can never go wrong with a refrigerator full of white wine. Hope you enjoy the dish.